Yay, I finally finished Woodland Fairy:) Here she is in all her glory ! As I was getting near to the end I really began to dislike the fabric I had chosen for this pattern. It is very stiff and it was hard to keep good tension on. After stitching on some other fabrics, I don’t think I will ever stitch on something like this again. I also realized how much I prefer 32 over 28 count. But now she is done and I can get her framed. Maybe in time for the holidays. Woodland Fairy turned out just beautiful! Oh Leslie, great job! You must feel so relieved and happy 🙂 I can’t wait for you to start Bordeaux Sampler with Anne and I now! Hooray!! Good on you Leslie – she looks marvelous!! Congratulations, Leslie! She looks incredible! Woohoo! That certainly is one big happy dance. She looks wonderful! Now you have to save up and get her framed to showcase your beautiful stitching. 🙂 Congratulations! Congratulations Leslie, she looks gorgeous. Looking forward to seeing her framed. Congrats on a fantastic finish!!!! WF is exquisite. What a lovely job of stitching you did. Just lovely. Congrats. She is gorgeous! Great job!! She is glorious looking!! 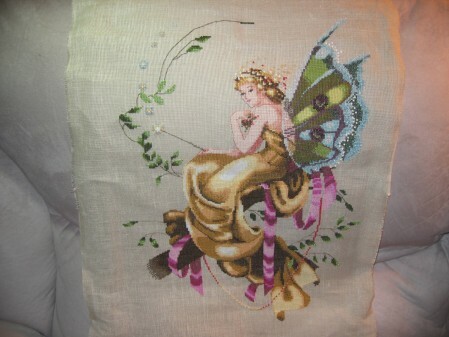 You did an amazing job stitching this beautiful fairy. Oh how beautiful! Congrats on your HD!